What is in the Mueller family well? Jessie was Tony-nominated Broadway debut in a revival of On a Clear Day You Can See Forever that was otherwise ignored. She won her Tony for her star-making Carole King in Beautiful: the Carole King Musical. Her sister Abby is now playing the role in the national tour, currently playing the Connor Palace, and whenever she’s on stage things are indeed beautiful. A. Mueller’s King is intelligent, funny, sympathetic, empathetic, and relatable. And she sings real good too. The show, directed by Marc Bruni with a book by Douglas McGrath, that surrounds her is polished and professional, if not necessarily distinct (although costume designer Alejo Vietti creates some fun period looks and a few magical quick changes). The story is somewhat thin–Carole falls in love and becomes a successful writer. She gets divorced and records tapestry–and padded with other hits of the era under the pretext that they were written by friends of King or came out of the same office she worked in before moving to the West Coast. This glimpse into the music biz in the 1960s is not as interesting as it could be, but the baby boomers around me sure loved hearing those songs. But the show has one clear objective–to make you like Carole King and appreciate the emotional context for Tapestry (an album the production assumes you already know and love…and let’s face it, your probably do). In this–thanks in large part to the utterly delightful Abby Mueller–it is unquestionably successful. 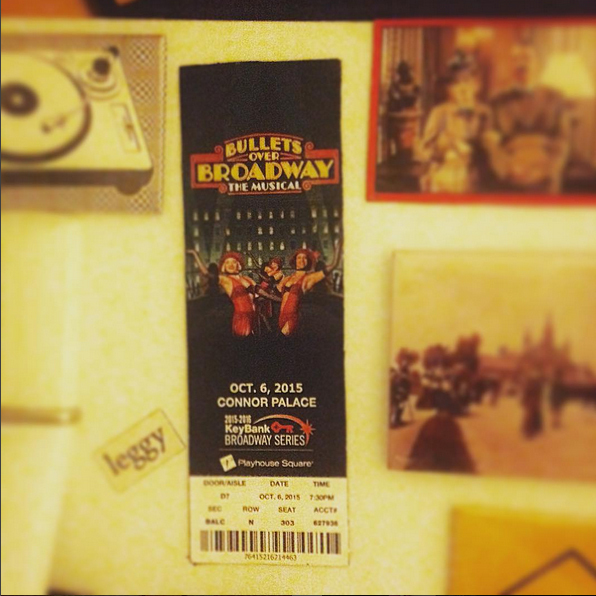 Last night I saw the first official performance of the 1st National Tour of Bullets Over Broadway: The Musical. I had trepidation about the show from the start because I knew that, despite this being a 1st National Tour, it was a non-Equity production, which made me queasy both ethically—they’re charging Broadway tickets prices and paying the actors 25% of a Broadway salary—and artistically. Once the house lights went down, however, the cast’s lack of union representation was the furthest thing from my mind. They didn’t sell magnets so I had to make one out of my ticket. The cast was, by and large, excellent. Recent college graduate Michael Williams is wonderful leading man: instantly likable, an impressive dancer, a fine singer, and in possession of good comedic timing. I imagine this won’t be the last time I hear from him. The three leading ladies—Hanna Rose Deflumeri, Jemma Jane, and Emma Stratton—are all fantastic singers. The latter two are pretty darn funny as well. (Deflumeri had more of a “straight man” role and as such didn’t have to opportunity to exhibit whatever comedic chops she may or may not possess). The remainder of the cast and ensemble fully inhabited the zany world of the show and pulled off Susan Stroman’s impressive choreography (recreated by Clare Cook) enthusiastically. But a well-executed musical (I’m sure there’s a gangster pun in there somewhere) is not the same as a good musical. And I’m not even sure that Bullets… is a musical to begin with. There were definitely songs, dances, characters, and the general shape of a plot, but they rarely had anything to do with each other. The score represents the first time in which I’ve seen a jukebox musical in which 90% of the audience has never heard of 90% of the songs. The book (by Woody Allen and Douglas McGrath based on their screenplay) tried to squeeze in jokes wherever it could, but failed to justify the actions of their lead characters or the existence of the minor ones. (There is a character whose sole arc is seeking psychiatric help for a stuffed dog. Another character gets two unrelated plot lines—if you count “having an affair with a mobster’s girlfriend for no discernible reason” and “eating pastries” as plot lines.) The songs—aside from a phallic ode to hot dogs–were largely devoid of any humor whatsoever unless Stroman was able to find a way to ignore the content and choreograph a joke on top of it, a rabbit she managed to pull out of her hat a few times over the course of the evening. While the performances and heroic efforts of Susan Stroman (at least as a choreographer…perhaps she should consider ceding directing duties to those with a better understanding of musical development) created an evening with much to enjoy, the disjointed affair didn’t give us anything to like.